by Josep Lluís Mateo ETH Zürich, and Krunoslav Ivanišin, Park Books. Zürich, 2013. 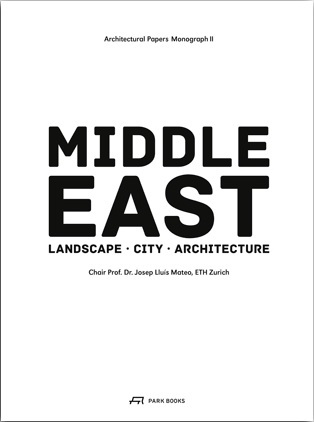 This issue of Architectural Papers brings together material about the contemporary practice of architecture in the Middle East. The Middle East, a central place due to its history and geographical position, formalizes some of today’s tensions. Here, the DESTRUCTION–CONSTRUCTION dialectic appears without metaphors alongside the tensions between IDENTITY AND COSMOPOLITANISM that have always accompanied modernism and which, in times of globalization, must be regarded in a new light. In our globalized world, any claim to exoticism becomes meaningless, so looking at and understanding the “Other” is simply a means of finding out more about ourselves. THE OTHER MERGES WITH US. Our role here, to a large extent, is to find interlocutors and scenarios that allow our arguments to expand and transform. Our viewpoint is at once distant and close. DISTANT, because sometimes architecture disappears into the landscape, or behind words; but also CLOSE, where detail, material, texture, shadow, and light affect us. And where the singular experience, sometimes, comes to the fore.